One of the top industrial chemical suppliers in the country was in search of a way to build even more awareness around their products and applications. 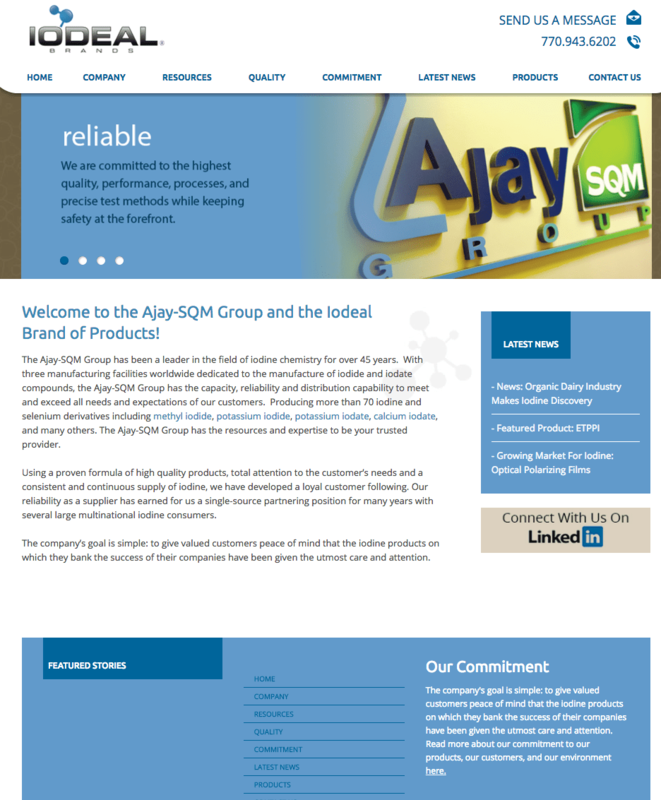 Ajay-SQM Group – the company behind Iodeal Brands – originally got its start in 1972, offering a better dye-oxidation technology solution for the U.S. textile industry. Their reputation for disrupting – and improving – marketplaces has carried through to today. However, with the digital landscape drastically changing business as usual, the folks behind Iodeal Brands needed help from a team with the know-how and vision to expand their reach. Of course, the question remains, how did we make this happen? Our client was clear that their primary concern was to build organic traffic and to generate authentic buzz around their brand through natural social sharing. Organic-focused strategies are extremely effective at building long-lasting brand-consumer relationships. However, they take time to develop. At the crux of any organic (SEO) strategy is a client’s website. Known as the hub of the marketing wheel, a business website needs to attract both users and search engines, and make it easy for visitors to funnel toward key conversion points. The key to remember here is that every page has a unique purpose. What we opted for here was a clean, minimal look, with a four-page slider atop, each featuring a keyword (reliable, proven, willing, capable) designed to build trust. Our focus on trust-building is why we also added a latest-news widget to the page. Not only do these latest news bits demonstrate Iodeal Brands’ role as the leader in this field; they also increase the chances of these articles being shared. From the onset, we knew social media would play an integral part of our organic strategy. But as we conducted thorough market research, we concluded that the most effective platform for a company like Iodeal was LinkedIn, which is why we made a point of including the network on our client’s homepage (as well as subsequent pages). As we optimized our client’s website, we went beyond just the look and layout of each page. We focused on how best to map the site in order to create a better user experience. In other words, which pages should we include in the main navigation? Should there be any pages nested beneath a parent page? This step in our website optimization required not just brainstorming and trial and error, but detailed research into our client’s market, and target audience. 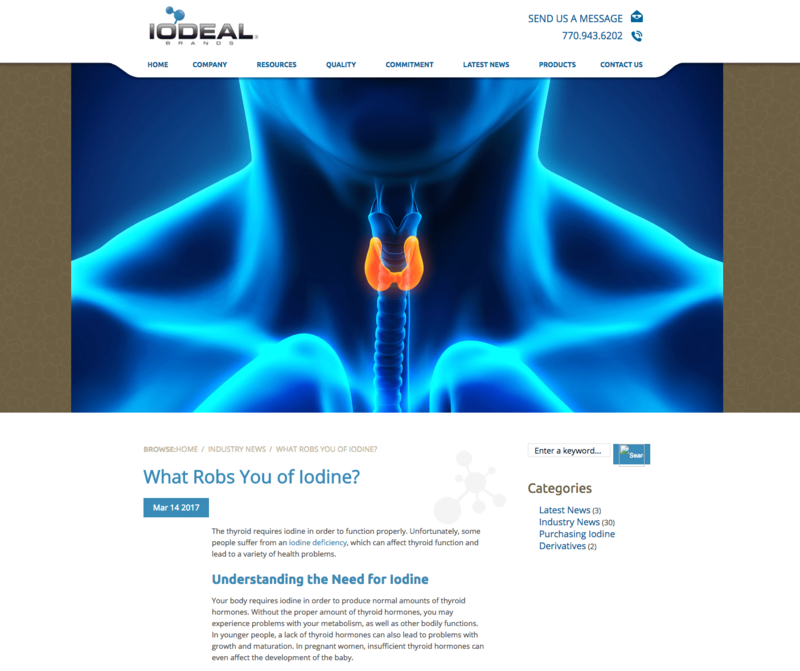 As our design and development team put the finishing touches on our client’s website, our content team got to work developing a strategy to increase traffic, shares, and interest in the Iodeal Brands name. The foundation of all of this is solid keyword research: we must know what type of content will bring in qualified leads. That’s why the content team worked side-by-side our SEO strategists to develop a comprehensive keyword list, which was then prioritized to ensure our client got the fastest return on investment possible. Using those keywords, we crafted an editorial calendar that outlined when we should create content, on what we should focus, and where that content should be published. This post was built around a keyword phrase our team concluded would bring in qualified leads to the site. The article is thoroughly researched and written, to ensure visitors to our client’s site would be rewarded with useful content. 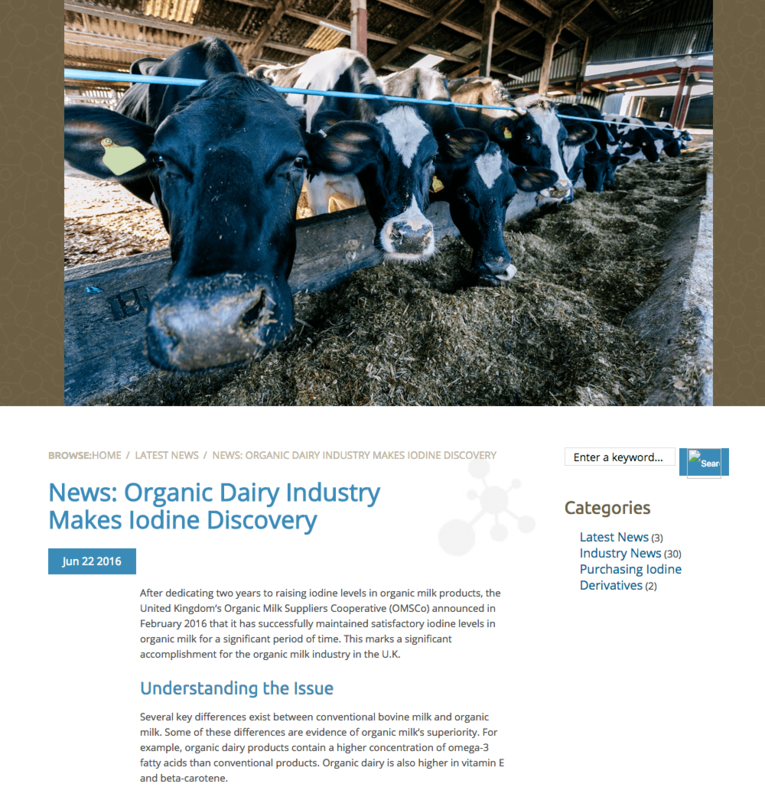 We also ensured this post (like most others on our client’s site) included internal links to other posts and pages (in this screenshot above, the link iodine deficiency leads readers to a post titled The Importance of Preventing Iodine Deficiency in Pregnant Women). This type of internal linking keeps readers and search engine on the website, which in turn boosts rankings. Our content marketing efforts don’t solely rely on chipping away at keyword research, however. Our client’s products and applications are associated with an industry that’s heavily mentioned in the news. … making this a worthwhile article to create. In fact, the article we published on behalf of our client serves as a direct answer to the highly shared article featured in the BuzzSumo screen shot above. Through our experience in building complicated organic marketing campaigns, we know that building traffic around keywords isn’t enough to get our clients ranking #1. Building authority – through backlinks – is the missing link. That’s why we continue to dedicate a huge portion of our content marketing efforts toward cultivating newsworthy topics we know readers will actively share among their own social circles. Our multifaceted approach to digital marketing has made it possible for Iodeal Brands to see a dramatic increase in qualified leads visiting their website, through organic search rankings and social shares. Of course, we’re not ones to rest on our laurels. We continue to refine our strategies, capitalizing on what works and tweaking the approaches that fall short. 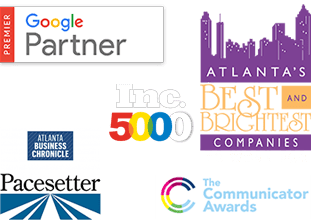 This constant commitment toward improvement is what will ensure that our client remains at the forefront of their industry regardless of what the future may hold.